Hope you followed our guidance and bought gold last Thursday. We mentioned last Tuesday that gold had bounced off a crucial support level at $1,240 an ounce — zooming up past $1,250. 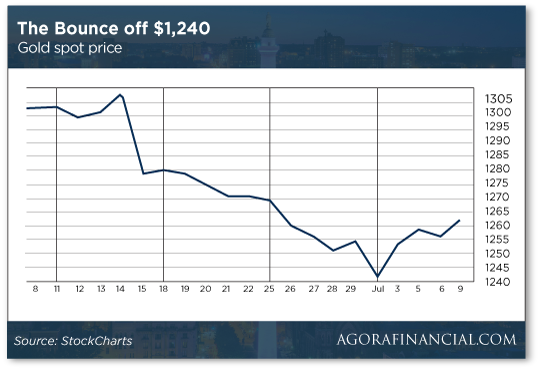 We gently suggested that if you wanted to add to your stash and were looking for an attractive price, you might want to contact your favorite gold dealer Thursday morning after the Independence Day holiday. Friday, gold closed at $1,254. As we write this morning, it’s up to $1,262. You’re welcome. We have a few more things to say today about the price of gold — which, bear in mind, is a measure of confidence in the U.S. dollar. SDRs are a super-currency issued by the International Monetary Fund. It’s circulated only among governments and central banks. As our macroeconomic maven Jim Rickards has been telling us for years, the IMF has issued new SDRs on only three occasions since 1969 — all of them linked to a crisis of confidence in the dollar. He says it will do so again whenever the next big financial crisis hits… and you know it’s coming, because none of the problems that set off the Panic of 2008 have been fixed. That’s a mind-bending concept by itself, but get this: Jim says there’s evidence this new system is already in place. The analysis that follows is informed by a contact of Jim’s in Switzerland who, for our purposes, we’ll identify as D.H. Bauer. Bauer undertook an effort to identify the price of gold denominated in SDRs. It’s not a figure you see very often compared with, say, the gold price denominated in dollars that we cite most every day in The 5. But there’s a dollar price of SDRs — right now one SDR is worth about $1.41 — so it’s not hard to extrapolate a gold price in SDRs. The dotted lines represent the overall trend in the gold price since the yuan was added to the SDR basket. 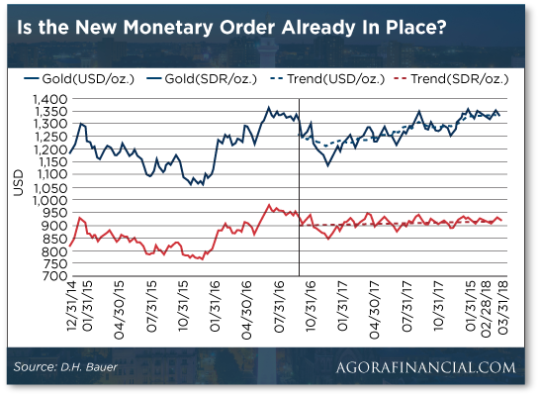 Indeed, since the start of 2017, gold priced in SDRs has traded in a very tight range between roughly 875–950. “It takes a while to sink in,” Jim says. “Why did SDR/GLD go from normal volatility to no volatility overnight? “The straight-line behavior of SDR/GLD after the Chinese yuan joined the SDR is impossible without some kind of intervention or manipulation,” Jim concludes. But how exactly would the powers that be pull off such a feat? How can SDRs be pegged to gold so tightly? “To peg a cross-rate, in this case SDR/GLD,” Jim explains, “you need a large floating supply of both components or a printing press to make as much as you need. Basically you conduct open market operations. “If the SDR price of gold falls below SDR900, you sell gold and buy SDRs (or the currency basket). If the SDR price of gold rises above SDR900, you buy gold and sell SDRs (or the currency basket). By monitoring markets and intervening continually with open market operations in gold and currencies, you can maintain the peg. “We can eliminate the U.S. Treasury and ECB as suspects,” Jim tells us. “Both are relatively transparent about their total gold holdings, foreign exchange reserves and the SDR component of their reserves.” Any manipulations would show up in their official reports, but they don’t. “That leaves SAFE and the IMF. Both are nontransparent. China has about 2,000 tons of gold (probably much more, but they don’t disclose the excess) and has been acquiring SDRs in secondary market trading in addition to official allocations to IMF members. “The IMF has about 1,000 tons of gold and can print all the SDRs it wants with its SDR printing press. The IMF also makes loans and receives principal and interest in SDRs. The SDRs can be traded through the IMF’s secret trading desk. We know this is a lot to wrap your mind around. What are the key takeaways? In the near term, it appears the SDR-GLD trading range is a tool you can use to time your gold purchases. Last Tuesday, gold priced in SDRs approached the bottom of its range at 884.5 SDRs per ounce. “Gold rallied right on cue,” says Jim. There’s your explanation for the bounce off $1,240. Jim is working on a tool you can use to trade alongside the Chinese and the IMF to bag short-term gold gains. Watch this space for updates. But that’s OK from Beijing’s perspective. For them, it’s all about “de-dollarization” — a keen desire to get out from under Washington’s thumb. The Chinese (and the Russians) are leading the way in the global trend of nations trading with each other using local currencies instead of the dollar. The gold-SDR link is the next logical step in that plan. [Ed. note: Jim’s connections in Washington have just tipped him off to a “secret” bill making its way through Congress — one that’s serving up a huge trade opportunity. The on-again, off-again trade war jitters are off again. Well, that’s the mainstream explanation for the Dow jumping 250 points on the day. At 24,700 the Dow is its highest in three weeks. Blue chips are rallying harder than small caps, but the major indexes are up across the board. Currencies are gyrating a bit on the news that British Prime Minister Theresa May’s government is falling apart. Foreign minister Boris Johnson resigned this morning because he doesn’t like the direction that “Brexit” talks with the European Union are going — he’s a pro-Brexit hard-liner. The pound is falling off a small cliff, from $1.335 to $1.324 in the space of two hours. Before we get to the mailbag, a brief update on the nutty state of Bay Area real estate. 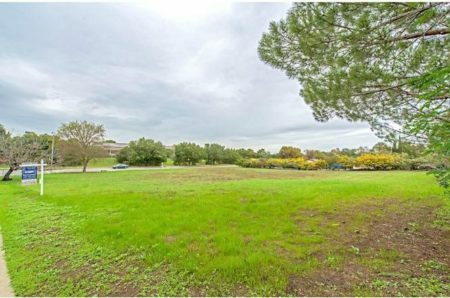 Meanwhile in Silicon Valley, a one-acre vacant lot in Palo Alto is on the market for $15 million. The upside? It’s only minutes away from the headquarters of Google and Tesla — among others. The downside? “The property’s future owners would not only need to shell out the $15 million for the property, but likely millions more to build on top of it,” Business Insider points out. You get the sense they’re trying a little too hard? “Also Permitted & Conditional Permitted usages other than residential,” they point out. Hmmm… The lot’s been on the market since March 2014. Is the asking price too steep, or are California building regulations so onerous no one wants to bother? “OK, so the Fed just told Kudlow to piss upwind on rate hike speed, and that has me wondering how this will all pan out,” a reader writes after Friday’s 5. “Tariffs, in my opinion, are stealth tax increases (as far as the people are concerned) that have no benefit other than fattening the government’s coffers. “Those tariffs, if and when they are passed on to consumers, will cause price inflation, right? Does the Fed know (or even care) that not all inflation is created equally? Price inflation due to tariffs/taxes is not the same price inflation as caused by a hot economy and upward wage pressures. My concern is that the Fed will use tariff-based price inflation as an excuse to raise rates and tank the economy. Your thoughts? The 5: We’d be happy if the Fed were ended altogether. But that takes us out of the ranks of the Very Serious People who populate Washington and Wall Street. You raise an interesting proposition: Would the Fed purposely undermine Trump by jacking up rates in response to price increases, even if those price increases are attributable mostly to tariffs? “I didn’t see where, in Kudlow’s remarks that you quoted, he was actually dictating to the Fed what they should do,” another reader points out. “It was just the president’s top economic adviser, who presumably should know a thing or two about economics in general and monetary policy in particular, giving the Fed some advice. “Now that advice might come with the veiled threat that the Fed will be held accountable for the results of its actions. Kudlow could be suggesting that, since he understands the potential impacts of the Fed’s tightening policy on the U.S. economy, his boss, the president, understands too. And everyone knows that the current president is no Pappy Bush; he’s not the type of guy to just lay down and take the fall for someone else’s screw-ups. “Bigger picture, our whole separation of monetary policy from politics through an ‘independent’ Fed is bizarre. It’s an admission by incompetent and/or corrupt politicians that they can’t be trusted with the keys to the national cash register — which has a printing press inside. The 5: It’s been an interesting charade under Clinton, Bush 43 and Obama — the White House making a big point about not publicly saying what monetary policy should be. The reality of the situation was spoken rather plainly by Arthur Burns — the hapless Fed chief who turned on the monetary spigots to help Richard Nixon win re-election in 1972, an act that set the stage for near-runaway inflation in the late ’70s. P.S. While the world is distracted with trade wars, the midterm elections and Hillary running in 2020 (! )… Jim Rickards is following the fortunes of a “secret” bill making its way through Congress. Jim’s recorded a short audio message about it. Click here to listen.